Rental Costume includes: This dress comes in a variety of styles and colors, solids as well as prints. It is a fully constructed and boned bodice with a full skirt and built-in petticoat. It is often trimmed with lace and matching braid. This ensemble also includes a mob cap. Rental Costume includes: This is a dress of the 18th century in a floral print with attached panniers (side skirts, fabric bunched from the waist at the hips and sides, fashionable during the colonial period). The dress is trimmed in white lace and braiding. It also includes a colonial mob cap. Rental Costume includes: This outfit is intended for everyday wear during the colonial period for typical men of the period. It would be suitable for characters such as John Adams or Paul Revere. It includes a jacket, vest, trousers in solid colors with contrasting buttons and trim. 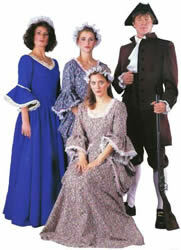 The outfit includes a full sleeved colonial shirt, jabot (neck piece), colonial stockings, shoe buckles and tricorn hat.